The Department of Adult and Pediatric Orthopedics, Orthopedic Surgery at the University Hospital Saarland offers the full range of diagnostic and therapeutic services in these medical focuses. The department specializes in conservative and surgical treatment of all diseases of the musculoskeletal system. Surgical interventions are performed in the state-of-the-art operating rooms, while conservative options include physiotherapy with therapeutic baths, gym, swimming, electrotherapy, massage and other therapeutic options. The department is headed by Prof. Dr. med. 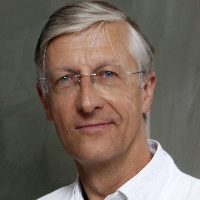 Dieter Kohn. In addition to successful clinical practice, the department can boast of outstanding research activities within its own Laboratory for Biomechanics. It conducts a variety of biomechanical studies of new implants and surgical techniques. At the moment, active research is being carried out in the field of knee and shoulder surgery. In addition, in close cooperation with the Department of Trauma Surgery, osteosynthesis procedure stability is being studied. A special diagnostic offer of the department is X-ray diffraction analysis used in many orthopedic studies, since its high accuracy allows to accurately measure the movement of implants and bones in fractures, osteosynthesis, spondylodesis and endoprosthetic replacement. Since 1996 Head of the Department of Adult and Pediatric Orthopedics, Orthopedic Surgery at the University Hospital Saarland, Chair of Orthopedics. 1990 Habilitation, Hannover Medical School. 1978 Doctor’s Degree at the University of Ulm. 1972 - 1978 Education at the University of Ulm. 2011 President of the German Society of Orthopedics and Orthopedic Surgery (DGOOC). 2006 - 2008 President of the German Society of Orthopedic Traumatology and Sports Medicine (GOTS). 1995 - 1998 President of the German-speaking Working Group on Arthroscopy (AGA). 2007 Member of the German Academy of Naturalists "Leopoldina". 2004 Honorary Member of the Arthroscopy Association of North America (AANA). 2001 Member of the Royal College of Surgeons of Edinburgh (Fellows of RCS Edinburgh). 1991 Honorary Member of the American Orthopedic Society for Sports Medicine. 1991 John J. Joyce Award of the International Arthroscopy Association (IAA). 1988 Michael Jäger Prize of the Society for Orthopedic Traumatology and Sports Medicine. Department of Adult and Pediatric Orthopedics, Orthopedic Surgery.